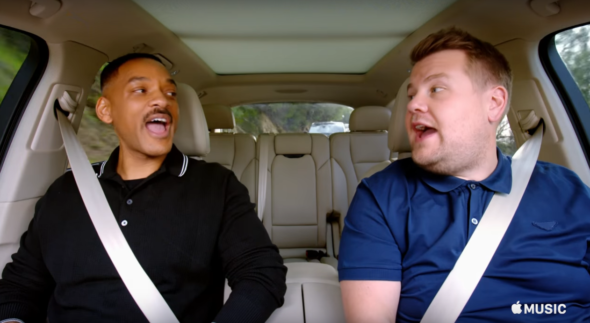 “Do you mind if we listen to some music?”Apple Music has released a first look at their upcoming Carpool Karaoke series. The show is based on the popular segment from The Late Late Show with James Corden that features the host and various celebrities singing their own songs and other hit tunes in a car. The spin-off series will include guest appearances from Will Smith, Shaq, Chelsea Handler, Blake Shelton, John Legend, Billy Eichner, Ariana Grande, Michael Strahan, Jeff Gordon, John Cena, and more. Apple has not yet announced a premiere date for Carpool Karaoke: The Series. What do you think? Are you a fan of Carpool Karaoke? Will you watch the series? More about: Apple Music TV shows: canceled or renewed?, Carpool Karaoke, Carpool Karaoke: canceled or renewed?